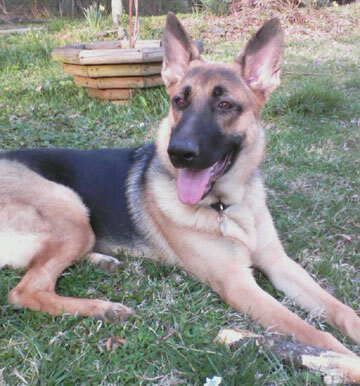 This is Kane, he was a birthday present for my 17 year old son (Zack) after we had to put down his 12 year old GSD due to degeneritive malopathy only 4 days before my son 17th B-day. Kane is now 7 1/2 months old and is a joy and new light in our life's. Painfully aware that you can never replace a loyal companion of 12 years, we know we made an excellent choice getting another GSD. Kane is fearless, confident, playful, extremely smart, loving, beautiful, and a barrel of fun & laugh's. I never thought we would get this attached to another animal again, but Kane has filled our heart's and he is helping to mend a painful void left from losing a 12 year member of our family. I am constantly amazed by the German Shepherd breed, just when you think you have seen it all....they will do something new that leaves you in awe of this exceptional breed..
We would love to see our beautiful boy as GSD of the month but either way he'll always be dog of the month in our home. Hello Angela, what a great GSD story. And thank you so much for sharing your great story about your wonderful German Shepherd puppy Kane. It's always nice to hear about all our sweet little baby German Shepherds out there. And what a wonderful picture of Kane - I really love it!